NEW YORK — Honored for a career of audacious, one-of-a-kind work Monday night, playwright Suzan-Lori Parks thanked her creative writing professor from Mount Holyoke College, the late James Baldwin. “I’ve been working all these years to prove him right because I don’t have the heart to prove him wrong,” Parks told a roomful of theater luminaries who had gathered to see her presented with the Steinberg Distinguished Playwright Award, the second-most prestigious playwriting award after the Pulitzer Prize. Of course, Parks, 55, has already won the Pulitzer. She got it in 2002 for Topdog/Underdog, becoming the first black woman to win the award for playwriting. Her acceptance speech was loaded with her trademark mirth — Parks dabbed when she recounted being chosen for Baldwin’s creative writing class. She also recalled how his approval provided more than emotional support. When she first moved to New York as an unknown playwright, there were no reviews of earlier work to send to the press with the announcement of her new work. But she had an endorsement from the nation’s most incisive and elegant writer on race: Baldwin. So the quote from his evaluation of her college work was put in the press packet. 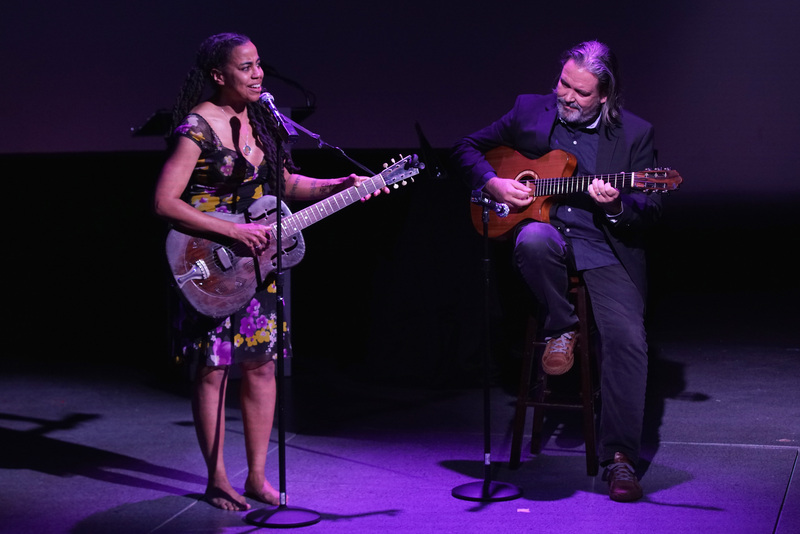 Playwright and honoree Suzan-Lori Parks (left) and her husband, Christian Konopka, perform at the 2018 Steinberg Playwright Awards at Lincoln Center Theater. Parks’ work, as Public Theater artistic director Oskar Eustis described it, is “nuts.” Eustis was specifically referring to Parks’ decision in 2002-03 to write 365 plays in 365 days, which the Public later agreed to mount. Some were only a page long; one of Parks’ producers informed me that Parks had decided that for a play to be a play, the production really only needed a door. Besides her stunning, yearlong creative marathon, Parks also has written in the lobby of the Public Theater, even holding workshops with other writers — sort of a playwriting twist on the Marina Abramović work The Artist is Present. It’s as much a performance piece as any of her plays, and she titled the enterprise Watch Me Work. “Her boundary-breaking is joyous and mischievous,” Eustis said. In the Newhouse Theater on Monday evening, actors Amari Cheatom, Brandon J. Dirden, Crystal Dickinson and Roslyn Ruff read excerpts from Topdog/Underdog (1999), Getting Mother’s Body (a 2003 novel), The Book of Grace (2010) and Parks’ latest work, White Noise, which will debut at the Public Theater in 2019. Parks writes black characters who face racism and poverty but also demand joy for themselves. They are equal parts crafty and sentimental, like Billy Beede, the pregnant, 16-year-old heroine of Getting Mother’s Body, Parks’ take on William Faulkner’s As I Lay Dying, which is told through the eyes of a black Texas family. The evening was a celebration of artsy black girl brilliance. Parks explained that when she moved to New York, she crashed with Laurie Carlos, the actress who originated the role of Woman in Blue in Ntozake Shange’s for colored girls who have considered suicide/when the rainbow is enuf. Shange was only the second black woman after Lorraine Hansberry to have a work mounted on Broadway. 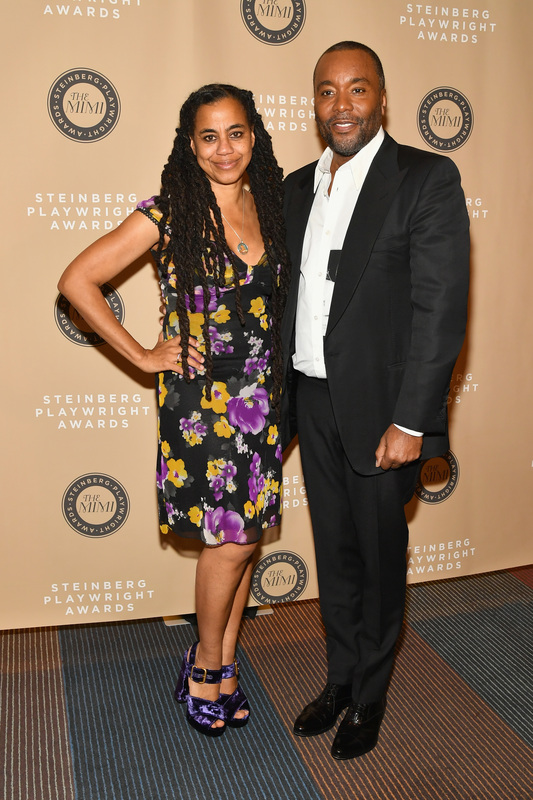 Honoree Suzan-Lori Parks (left) and Lee Daniels attend the 2018 Steinberg Playwright Awards at Lincoln Center Theater. “What impacted me most was Topdog/Underdog,” The Butler director Lee Daniels told me. “That just sent my head spinning.” Topdog/Underdog bubbles with improbable hilarity: Its two main characters are black brothers named Lincoln and Booth. Lincoln makes his living as an Abraham Lincoln impersonator who will gladly take money from anyone who wants to pretend to shoot him in the head. Daniels is now collaborating with Parks (who also wrote the screenplay for Spike Lee’s Girl 6) on a new film, The United States vs. Billie Holiday. Parks wrote the screenplay, and Daniels is directing. “It’s been a great working experience,” Daniels said. “I flew out from Los Angeles just to see her get this award because I’m so honored to be working with her.